With the ongoing road-widening activities in full swing and the early arrival of Monsoon this year, it is becoming increasingly risky for people to travel along the national highways today. Over the past couple of months, we have seen a number of tragic accidents along the West-East National Highway that have killed both foreign tourists and Bhutanese nationals. As a mountainous country, the topography of Bhutan itself is not friendly for road travelers but during the Monsoon season, the highways become even worse. The road blockages due to landslides and shooting boulders along the national highways are once again becoming a common phenomenon. As a result, it is very important to take extra caution while driving nowadays. We have already lost many precious lives due to reckless driving. Only the affected families would be able to feel the real pain of having to lose somebody like this. The heaps of sands and lose soil alongside the roads, and the overhanging boulders due to the road-widening activities are some of the most dangerous risk factors for road mishaps. As a driver, one should drive slowly and cautiously so that everybody would be safe. Travelling along the national highways today is like travelling between life and death. One has to be always alert and vigilant because anything can happen any time. On the afternoon of Saturday, 29th April 2017, Jigme Namgyal who is the first visually impaired film actor in Bhutan was on his way back to Thimphu from Bumthang. Travelling with him in his Hiace Bus were his driver and his wife. When they reached Tiki Zampa in Wangdue Phodrang, the bus suddenly skidded off through the roadside sands and veered off the road. The bus rolled over through the trees and finally landed on the bank of the river. 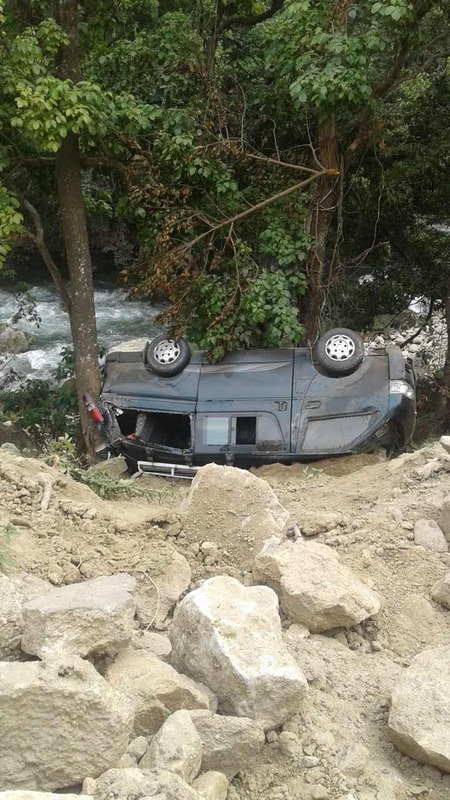 Although the driver and his wife escaped with minor injuries, Jigme remained unconscious for a couple of days and when he regained his consciousness, he could not talk due to the shock and trauma the incident left him with. “I thought I was going to lose my speech forever” he told me after he was discharged from the hospital. He said he was so happy when he could finally utter some words. To the relief of his anxious family and close friends, the doctors announced that he had no critical injuries. To those of us who knew him, the news of his quick recovery brought a huge sense of relief. We were so happy to know that he and his team were able to survive this tragic incident. But as you know, not everybody can be equally lucky like them. Considering such dangers, it would be best not to plan any major long-distance travels at this time of the year. I had a terrible experience in September 2015 when I had to go to Bumthang to attend a workshop. We had to literarily squeeze our way through mudslides and falling boulders. The stretch between Wangdue Phodrang and Trongsa was the worst part of the journey and I guess it is still the most dangerous area. Since then, I have promised that I would never plan my trip to the East during the Monsoon season. Recently, a team of my colleagues had to travel to Mongar via Phuntsholing and Samdrup Jongkhar following the reports that the road was blocked at Nubding due to landslides and shooting boulders. I wish if we do not have to travel at all during the summer. It is hard to even think how many people have to die in road accidents every year around this time. The next three to four months will be the most critical phase of the year. With Monsoon getting more aggressive day by day, we don’t know how many people still have to die on our roads over the next couple of months. It is therefore extremely important for us to carefully plan our travels and drive with special caution and care. Nature can never be commanded. We should be able to negotiate with it. So, always be cautious and stay safe.